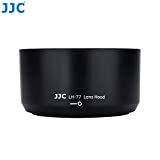 JJC LH-77 Lens Hood is designed to prevent unwanted stray light from entering the lens by extending and shading the end of the lens. It has a non-glare matte finish on the inside to further prevent or limit lens flare. There is no vignetting with the hood on. It can be placed backwards over the lens for a more compact storage solution. The hood allows you to put on a filter and a lens cap. In addition, since the end of the lens is extended, you also get the added benefit of some extra protection from accidental impact. JJC LH-77 replaces NIKON HB-77 lens hood. This entry was posted in Discount Photography and tagged 70300mm, f/4.56.3G, HB77, Hood, lens, LH77, NIKKOR, Nikon, Replaces by Ball Photo. Bookmark the permalink.